I’ve heard from doctors that they can’t watch hospital series like ER and Casualty because of the medical inauthenticity of some scenes. Policeman surely say the same thing about the CSI franchise (okay EVERYONE says the same thing about CSI Miami). Dinner-ladies probably thought the same thing about Victoria Wood’s classic comedy series dinnerladies, for all I know. But these glitches don’t bother me of, course. I find it easy to immerse myself in a story. Most of the time. Except, there was one scene in the British television series, Whitechapel that jarred. But first of all, the SP on Whitechapel. 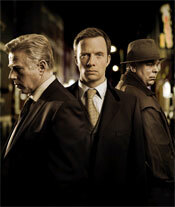 Whitechapel is a British crime series about a rough and ready bunch of veteran East End coppers, headed by D S Ray Miles (the ever brilliant Phil Davis) and played some familiar and tasty character actors. Well, all goes pear shaped (see how I’m getting into the lingo?) when they get a new boss, D I Joseph Chandler (played by Rupert Penry- Jones). Chandler is a fast-tracker who they think has walked into the job through having the right connection. And is he also very, very posh- a full on blue blooded toff. Invariably, he doesn’t fit in with the rest of the team and clashes with Miles more than somewhat. And things get worse when Chandler calls in a batty Ripperologist, Edward Buchan (the League Of Gentlemen’s Steve Pemberton) to help in his first high-profile case – a Jack The Ripper copycat. This Whitechapel first two-parter was great fun- full of Gothic atmosphere, blood and gore, quirkiness, black humour and genuine chills. The series was a great success and it was recommissioned. But how do you follow the Ripper story if you want to use the same copycat killer idea again? That’s right- you bring back The Kray Twins. Whitechapel’s second most famous killers come back as ghosts seeking REVENGE and go on the rampage. Or do they? They also used some weird CGI to make one actor look like twins. And worse still, they got the location of a famous East End boozer wrong! Everyone knows that The Grave Maurice was in Whitechapel Road but they said it was Commercial Road. And the pub that they used as a stand in for the presumably defunct Grave Maurice ,looked nothing like it. Still it was enjoyable enough tale, had its tense moment and some nice East End locations and atmosphere. But where do you go in season three if you want to follow the same formula? Well, you don’t have any other Whitechapel killers as famous as Jack The Ripper and The Kray Twins, so they did a sensible thing and focused on murders that echoed obscure and less well-known East End killings. And some chillers there were too, including a locked-room-mystery and fun reference to Lon Chaney. Also, this time the season was split into three separate two-part stories which worked really well. So, a cracking fun series with nice chemistry between the cast, funny, quirky moments, suspense and gore, and some smashing, ripping yarns – if you’re willing to suspend your belief and accept the slightly overstretched premise. My latest column at Pulp Metal Magazine. Next, The Krays do DINNER LADIES! Two soups of mayhem! Secondly another thank you for bringing this series to my attention – this one has slipped by me when i was meeting writing/illustration commitments. It’s a fun series.Especially the ripper one. You’ve raised an important point there, Paul. Too many television dramas are commissioned despite poor research, which should not be difficult to do, particularly if a programme is based in London. On most occcasions you do let this sort of thing go but it is becoming all too common. Excellent piece! Well, were pubs are concerened, we’ve got to take a stand!